AMHERST, Mass. 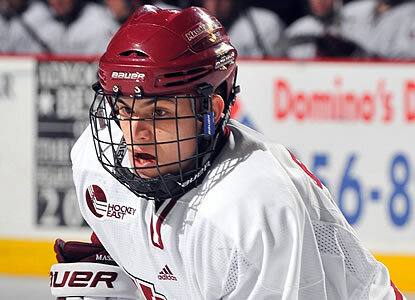 - Three third period goals propelled UMass hockey to a 4-2 victory over No. 1 Boston College before a raucous crowd at the Mullins Center on Saturday night. Steven Guzzo, Oleg Yevenko, and T.J. Syner all scored in the final period to give the Minutemen their first victory over a No. 1 team since a 5-1 victory over Boston University on Nov. 14, 2008 in Amherst, and gave the Eagles their first conference loss of the season. Michael Pereira also scored for the Mass Attack, tying the game 1-1 in the first period and that is what the score would stay until the eventful third stanza. UMass picks up its first Hockey East victory of the season, improving to 1-4-2 and 2-4-2 overall. The top-ranked Eagles fall to 8-1-0 overall and 6-1-0 in Hockey East. Freshman Kevin Boyle made 24 saves to earn the victory in goal. Chris Kreider's eighth goal of the season drew Boston College within one, making it 3-2 with 4:26 left in regulation, but the UMass defense stood strong down the stretch and senior captain T.J. Syner capped of the victory with an empty net goal, his fourth of the year, making it 4-2 with 31 seconds left. The freshman Yevenko made it a 3-1 UMass lead with 6:31 left in the third period when he took a cross-ice pass and scored top-shelf from the left circle for the first goal of his career. Danny Hobbs and Adam Phillips assisted on the play. Guzzo put the Minutemen on top, 2-1 with 15:58 left in the third period when the redshirt-freshman tucked the puck into the right side of the goal off the rebound of a Rocco Carzo shot. It was Guzzo's second goal of the season. Carzo and Troy Power were credited with assists. Despite six total penalties in the second period, five of which were on BC, neither side could beat the other's goalie, sending the game to the third stanza tied 1-1. The Eagles were able to kill off four-straight penalties during the middle portion of the period, including two separate UMass 2-man advantages of 10 seconds and 1:29. Just 1:45 after BC scored the game's first goal, Pereira tied things up, jamming in the rebound off an Adam Phillips point shot on the power play. The sophomore's team-leading fifth goal of the season was assisted by Phillips and Conor Allen. Steven Whitney put BC on top 1-0 5:15 into the game when he took a cross-crease pass from Johnny Gaudreau and scored top shelf on the power play. It was the junior's sixth of the season and came with 13:00 left in the first. The Mass Attack returns to action on Friday when it hosts Holy Cross in a 6 p.m. start at the Mullins Center.